Sen. Tom Cotton (R-Ark.) urged the Internal Revenue Service (IRS) on April 2 to investigate whether the Southern Poverty Law Center should retain its tax-exempt status as a nonprofit. In a letter (pdf) to IRS Commissioner Charles Rettig, the Arkansas senator accuses the Southern Poverty Law Center (SPLC) of engaging in political defamation, which does not qualify for a tax exemption. “Recent news reports have confirmed the long-established fact that the SPLC regularly engages in defamation of its political opponents. In fact, the SPLC’s defining characteristic is to fundraise off of defamation,” Cotton wrote. Cotton also points out that the SPLC holds nearly $500 million in assets—including $121 million in offshore accounts—while paying its executives exorbitant salaries. The SPLC did not respond to a request to explain why it holds funds in offshore accounts. The senator sent the letter as the SPLC deals with a crisis, following reports that it suffers from a pervasive culture of racial discrimination and sexual harassment and assault. 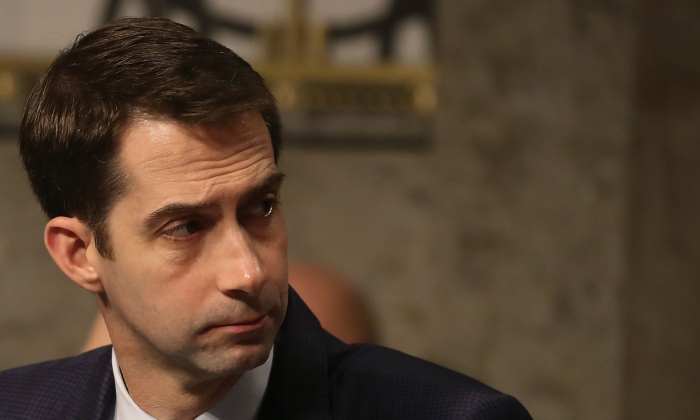 “Based on these reports and in the interest of protecting taxpayer dollars from a racist and sexist slush fund devoted to defamation, I believe the SPLC’s conduct warrants a serious and thorough investigation,” Cotton wrote. Cotton argues that under the guise of its “hate map”–which identifies hate groups like the Ku Klux Klan and the Nation of Islam–the SPLC defames its political opponents, including legitimate and reputable organizations like the Family Research Council, the Center for Immigration Studies, and the Alliance Defending Freedom. Last June, the SPLC paid $3.4 million to British political activist Maajid Nawaz after he filed a lawsuit accusing the organization of defamation for labeling him as an anti-Muslim extremist. Nawaz is a Muslim and the founder of a counter-extremism think tank that challenges the narratives of Islamic extremists. Cotton wrote that, in addition to injuries to character, the SPLC’s “hate map” has resulted in real-world violence, including the attempted mass shooting at the headquarters of the Family Research Council headquarters in 2012. The shooter told investigators he selected the Family Research Council because he saw the organization on SPLC’s hate map. SPLC received the lowest rating, an”F,” from Charity Watch, a charity watchdog which exposes nonprofit abuse. SPLC received the failing grade because it has maintained high assets for more than three years. “Federal law prohibits tax-exempt organizations from inuring to the benefit of any private individual. Yet the SPLC has accrued more than $500 million in assets as of October 31, 2018,” Cotton wrote. The SPLC last month announced it had dismissed Dees over unspecified conduct. Longtime President Richard Cohen also announced he was stepping down. Dees has publicly denied any inappropriate behavior. No reason was given for Cohen’s exit. The SPLC didn’t respond to a request to comment on Cotton’s allegations.